The 28 metre sailing yacht Eileen II has been jointly listed for sale by Edmiston & Company and Aker Yachts. Built in 1934 by Scottish yard Alexander Stephens & Sons for tobacco tycoon Robert French, this gaff-rigged ketch underwent a major rebuild in 1986 under the name of Galashiel. An additional refit took place last year. Boasting strong teak frames atop a steel hull and largely original interiors, this yacht for sale can accommodate up to seven guests in four cabins with a crew of four. Her historically-styled interior offers a cosy, wood panelled main saloon complete with brass lamps, two dark wooden dining tables and padded corner seating, alongside a Jøtul cast iron retracted fireplace, which has been gold-plated. The master cabin has an en suite and skylights. Guests can relax and sunbathe while surrounded by traditional accents on deck, which was designed by Alfred Mylne, or sit back in a chair and enjoy a glass of wine and a good book. Power comes from a single 284hp Caterpillar engine and she has a cruising speed of nine knots. Since 1993, she has been commercially registered under the Norwegian flag. 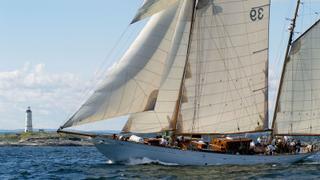 Currently lying in Oslo, Norway, Eileen II is asking €1,300,000.